Press the start button and the GasAlertClipExtreme is ready to use, providing continous and reliable protection. 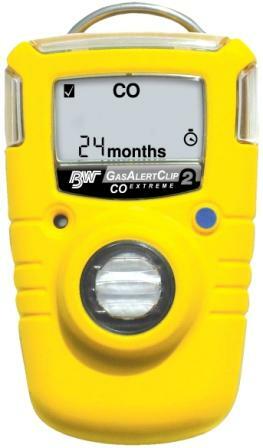 This single gas detector requires no sensor replacement or battery replacement. Size 1.1" x 2.0" x 3.2"
24 Month Life B&W Honeywell. 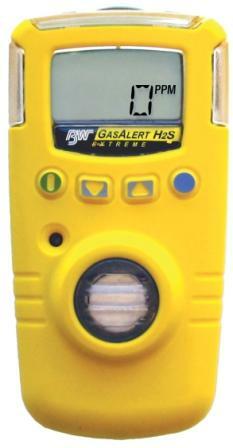 Compact and Affordable the GasAlert Extreme reliably monitors for any single gas hazard within its wide range of available toxic gas models as listed below. Keep this model for the long term as the sensor and battery are field replaceable when spent. Calibration is a simple, automatic procedure. The GasAlert Extreme is compatible with B&W's MicroDock II. Detector complete with specified sensor, stainless steel alligator clip and concussion-proof housing. Two years of hassel free service. One-Button activation, adjustable alarm settings and an easy-to-read display, the Protege ZM is simple to use. Just turn it on for the first time and he monitor does the rest. Once turned on, the the Protege ZM monitor doea not require charging or calibration so these monitors can be deployed in the field 24/7 for two years. Protege ZM includes both audible, visual and vibrating alarms. Time Remaining or Gas Reading or both. Battery Life typically: 10 Hrs. Recharge time, less than 4 hours. Available with 1 - 4 Gas Sensors. 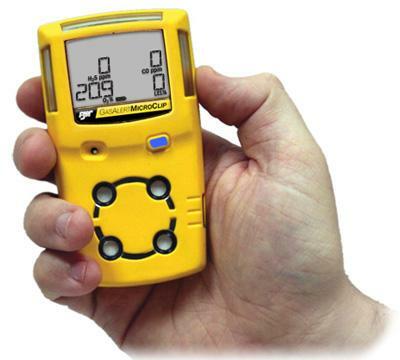 The slim and compact GasAlertMicroClipXT Multi-Gas Detector provides affordable protection from up to four atmospheric hazards. The GasAlertMicroClipXT offers continuous visual confirmation of detector operation. One button operation offers ultimate ease of use reducing training time. 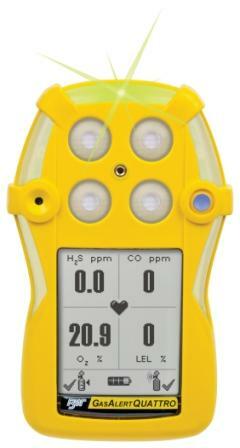 This meter is compatible with B&W's MicroDockII making calibration and data logging a snap. Calibration test cap and hose. Battery lasts 10hrs, recharge time, less than 4hrs. GasAlertMicroClipXT is available with 1-4 Sensors. Rugged and reliable, the GasAlertQuattro Multi-Gas detector combines a comprehensive range of features with simple one-button operation. With flexible power options, the Quattro is always ready. The graphic LCD displays easy to identify icons that indicate operational information such as bump test and calibration status for simplified onsite auditing. Intelliflash provides continuous visual confirmation of detector operation and compliance. The Quattro is compatible with the B&W MicroDock II. Confined Space Kit available. Calibration cap and hose, Reversible screwdriver. Manual, materials booklet and technical reference guide. 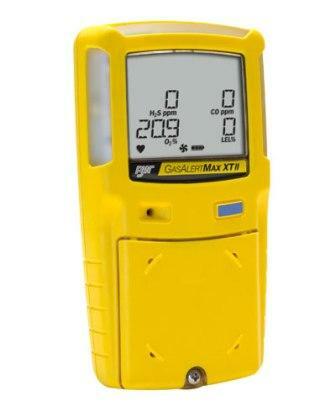 Size: 5.1" x 3.2" x 1.9"
GasAlertMaxXTII reliably monitors up to four gases. Simple one-button operation and a robust, built-in pump for remote sensing. When you need to draw samples from tight spots, just attach your tubing. There are no separate pumps to mount up, or aspirators to squeeze. 10ft sampling hose with particulate filter and quick connect. Manual and Multi-language CD Rom manual. 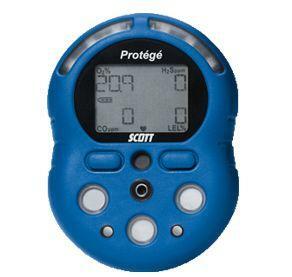 Size: 5.1" x 2.8" x 2.0"
The Protege 4-Gas meter is easy to use. The one-button on, two button off operation, makes the Protege user friendly and easy to train on. The rubber coated housing protects the meter from bumps and falls while being resistant to dust, water immersion and water vapor. The Protege features automatic calibration and simple PC configuration of optional parameters. With the optional Master Dock, calibration is a snap. Rated to survive dust, rain and immersion, you can feel confident using the Protege in all types of fire service and industrial applications. Size: 3.26"H x 2.76"W x 1.16"
Slip on pump with 12-Inch probe and 10-foot tubing. Manual Calibration Equipment, Quad gas and regulator. Customer Software Configurations or use factory defaults. The Protege is also available in a complete confined space kit.